Brickwork is evidently not adapted for drains of very small diameter, as there are, necessarily, very wide joints on the extrados of rings turned to a quick curve. 1 Breeze-bricks (see Part I.) may be substituted for these. 2 Sometimes one or two strips are used for each brick in the thickness of the wall. - Seddon, Builders' Work. Earthenware pipes, being cheaper and preferable in every way, have in most cases long since superseded brickwork for drains of less than 18 inches or 2 feet in diameter. 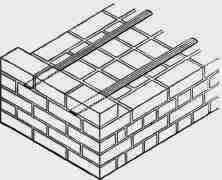 When pipes are not procurable, circular drains may be constructed with bricks as shown in section Fig. 50. This figure shows an 18-inch drain constructed with two half-brick rings, but as a rule the thickness of the brickwork need not be more than one ring, (or 4½ inches) in sewers of less than 3 feet diameter. Another form of brick drain consists of a semicircular inverted arch covered with a flat stone, S, the removal of which gives easy access to the drain for examination. Egg-shaped Sewers may be constructed of the section shown in Fig. 52. 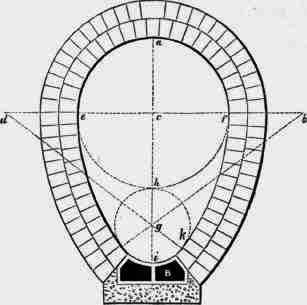 The proportions of such sewers vary according to circumstances; but in all cases the invert, i, should have a quick curve (of radius not exceeding 9 inches), and the crown should be a semicircle. 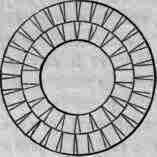 The usual method of construction is to make the diameter of the invert half that of the crown, and the height of the sewer equal to 3 times the diameter of the invert. Thus in Fig. 52 hi = cf = 1. gh = ½. ai = df = dk = 3. The invert may be formed either of brickwork in cement, with a terracotta invert block, or with an invert block bedded in concrete, as shown at B in Fig. 52. Oval or egg-shaped sewers are the best adapted for situations where there is an intermittent flow of sewage - that is, when the quantity passing varies considerably at different times. The reason for this is, that at the time when there is but a small quantity of sewage passing, it occupies in the narrow bottom of the egg-shaped sewer a greater depth than it would in a circular sewer of the same area of section. This increased depth of the sewage causes it to flow with greater velocity, and thus renders the sewer more efficient. When the flow of sewage is nearly uniform the circular sewer may be adopted, and will be found stronger and cheaper than the other. Bricks for sewers should be of the hardest possible description, and laid in hydraulic mortar. Even the best bricks will be gradually destroyed by the sewage. The inverts especially require to be of hard lasting material with a smooth surface, so as to resist as little as possible the passage of the sewage matter passing over them. They should, therefore, be formed with a smooth terracotta or fireclay invert block, as shown in Fig. 52, or built with glazed or very smooth bricks. Bricks " purpose-moulded " to the radii make the best sewers ; but where they cannot be obtained, blocks are sometimes formed with common bricks placed in frames, grouted and formed into a solid mass with cement. When sewers are constructed in a porous soil, the invert should be very carefully built, and a lining of puddle clay placed outside the sewer, so as to render it water-tight to half its vertical depth. Great care should be taken in filling in over sewers, so that large clods or masses of earth may not be allowed to fall upon the brickwork and injure it. Sewers are frequently built in concrete either alone or combined with brickwork. When concrete is used by itself it is sometimes rammed into a trench round a mould of the section intended for the sewer, so that the sewer consists of a rectangular block of concrete containing a circular or egg-shaped tunnel. In many cases, however, the concrete is lined with brickwork, and sometimes the lower part only of an egg-shaped sewer is built in brickwork, the upper portion being finished with concrete rammed in over a centre. Concrete is also much used for the foundations of sewers in unfavourable positions ; the lower half of the sewer is imbedded in a block of concrete, which is made of a width and thickness suitable to the nature of the ground. Sewers are also built up of hollow terra-cotta segment blocks, which fit into one another with groove and tongue joints. The construction of drains with stoneware pipes, and of sewers in concrete, or in segment blocks, will not be further noticed, as the subject does not fall within the limits of this Course.